Ergonomic design in forklifts and warehouse handling equipment has a long history at Linde Material Handling. The foundations of this were laid with the development of the hydrostatic drive, more than 50 years ago. This technology enabled unrivalled precision control, and made the operator’s job easier. Since then, designing around the requirements of operators has given rise to numerous innovations which reduce the strain on the driver and make for increased comfort and safety. And beyond the truck itself, the ergonomic principle has shaped development at Linde. Whether safety devices, fleet management software, or service concepts – it’s all geared toward perfect synergy between man and machine. Operators of forklifts and warehouse handling equipment are exposed to a wide variety of mechanical vibrations in their daily routine. The technical term is human vibrations, meaning vibrations, shocks, and impacts which occur during routine operation. Even if the individual vibrations are barely perceptible – taken as a whole they put a considerable strain on the employee. For more than 20 years, therefore, Linde Material Handling has worked intensively to research and develop technologies to effectively guard the operator against these forces. With success: Linde products do not only fall below the legally prescribed limits. Linde trucks also regularly come out on top in independent tests versus competing designs. Alongside the hydrostatic drive, which among other things ensures gentle acceleration and braking, the operator is above all protected by the systematic isolation of the individual components. 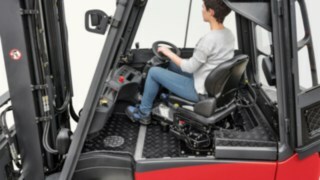 The ergonomic design of the operator’s workplace is therefore the key to safe, comfortable, and efficient operation. Since the strain on the operator is low, the accident risk is reduced, absences due to illness go down, and performance increases. 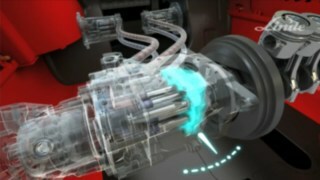 Maximum acceleration is automatically regulated. As soon as the operator takes their feet off the pedals, the truck comes to a stop. Braking is not necessary. Since both feet are constantly in contact with the pedals, the operator is always getting direct sensory feedback about the movement of the truck – it becomes an extension of their body. With forklifts and warehouse handling equipment from Linde Material Handling, man and machine form a single entity. 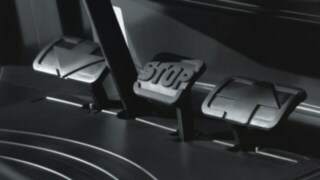 In all types of trucks, control elements are arranged such that the user can always easily reach them. Regardless of which model, the operator’s workplace is optimised for the truck’s intended purpose, or can be adjusted to it. 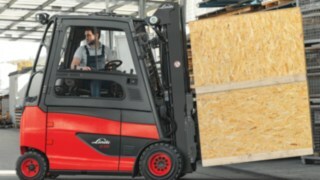 An example is the new platform lift truck Linde T 20 - T 25 SP. Thanks to Linde’s e-driver technology, it can be comfortably operated with one hand. The operator stands, relaxed, at a 45° angle to the direction of travel, and has optimal all-round visibility of the route and the current load. 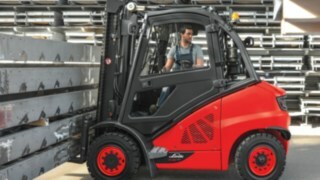 A unique selling point of the Linde forklift is the pivotable operator workplace (link to article). This gives the operator perfect visibility even when reversing, without having to twist their back or neck around. Linde Load Control ensures further operator comfort. 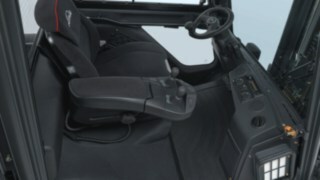 Using two joysticks integrated into the armrests, the operator can simply and precisely control the forklift’s working and auxiliary hydraulics. Ergonomic design of industrial trucks and operator workplaces will remain a central element of the Linde philosophy into the future. However, just as increasing digitalisation is changing the interaction interfaces between people and machines, so the focus of user-oriented design is shifting to encompass the entire working environment. The tasks ahead range from the design of user interfaces for assistance systems, controls, and software solutions, to the use of more mobile information technology in supporting operators and fleet managers.